Gould graduated from Duke University in May of 2017 with a Ph.D. in Literature and a certificate in Information Science & Studies. Her dissertation, “Digital Environmental Metabolisms: An Ecocritical Project of the Digital Environmental Humanities” is a hybrid study exploring the intersections of media materiality, the environmental humanities, digital art, and narrative communication theory. In August of 2017, she was hired as the Project Coordinator / Digital Humanities Specialist for the Franklin Humanities Institute. She also now teaches “Green Certified” Environmental Humanities courses for the Duke Literature Department and sits on the Environment and Culture Working Group for Duke’s new Healthy Duke Initiative. See Gould's CV, teaching websites, research, digital projects, public humanities writing, and online sites at amandastarlinggould.com. "Digital Metabolisms: Mapping a Digital Environmental Humanities through Materiality," plots the complex intersections of digital media and the environment, and questions the absence of environmental thinking from digital theory. The project draws out the tangible impacts that our networked digital technologies are registering on the earth to recognize them as critical sites for digital media study. What becomes clear is that the daily use of our weightless, wireless devices becomes ethically-charged with heavy issues of labor, pollution, human health, and environmental sustainability. By rejecting the easy premise of the digital network as purely computational, we see that contemporary digitality is profoundly environmental. 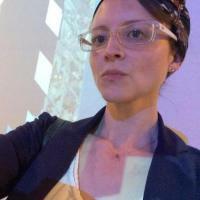 Her current teaching and research work investigates digital materiality, the bio- and geo-physicalities of the digital network, digital environmental humanities, environmental justice, digital communication, network ecologies, augmented realities, information architectures, digital publication design, and digital humanities scholarship.